The proper placement of a handicap parking placard is necessary to ensure a handicapped driver doesn't get an expensive parking ticket or, worse, get his car towed. It is the responsibility of the placard's owner to make sure the information on the placard is properly displayed and visible to parking enforcement officials. A handicap parking placard is invaluable to drivers in need. However, a placard is of no value if it is displayed in such a way that parking enforcement officials cannot see the placard from a reasonable distance and read the pertinent information. A placard left on a seat or tossed upside down on the dashboard are grounds for a ticket. Handicap parking placards should be hung from rear-view mirrors with the registration information and expiration date clearly visible through the windshield. If the information is not visible to a passing parking enforcement official, it can be legally assumed the placard is invalid. Placards not of a hanging design should be placed face-up on the dashboard to the left of the steering wheel. Make sure no other paper or garbage is covering up the placard. Visibility is the key. It's like getting pulled over for not having a license plate on your car. It may have fallen off and you have it in the car with you when you are pulled over. As the officer will explain, however, it is not enough to just have possession of a license plate. That plate must be visible to law enforcement officers and other drivers. It's the same principle with handicap placards. If the information on the placard is not visible, parking enforcement officials have no way to determine if the placard is legitimate or counterfeit. Information on the placard must not only be visible, it must also be legible. If stains or tears on the placard compromise legibility, replace the placard immediately. Besides not clearly displaying a handicap parking placard, another common mistake placard owners make is letting the placard expire. Check the date and renew the placard well in advance of expiration so there is no gap between the old and new expiration dates. Also, never drive with the placard hanging from the rear-view mirror. A placard obstructs the driver's view; this is not only dangerous, it is illegal. Hang the placard only when the car is parked. Remove the placard before pulling out of the handicap parking space. Finally, never lend a handicap parking placard to another person for any reason. If the person is justifiably disabled, whether temporarily or permanently, that person needs to get his own placard. The placard's owner is responsible for its use. 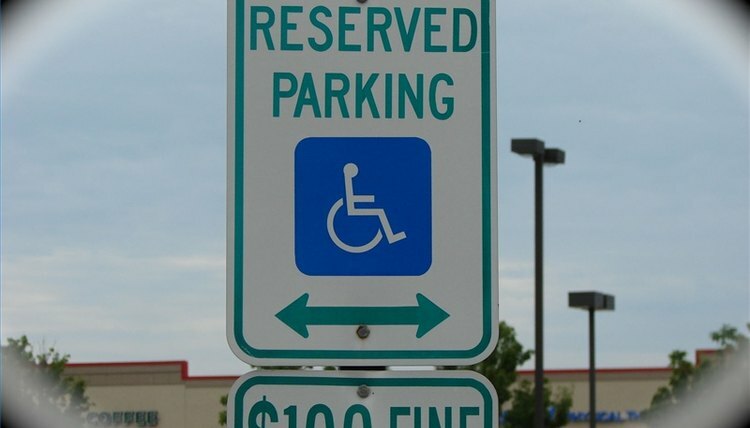 Misuse can result in steep fines and revocation of handicap parking privileges. Writer, Contributing. "Proper Way to Display Handicap Parking Placard." , https://legalbeagle.com/5184305-proper-display-handicap-parking-placard.html. Accessed 24 April 2019. Are Handicap Parking Placards Valid in All States?